At a postcard show in Madison, WI this past weekend I acquired a collection of 30 library postcards that were at one time part of a collection owned by Phoebe Hayes, a librarian who ended her library career around 1970 as Director of the Bibliographical Center for Research in Denver, CO. The postcards that I acquired have all been used and for the most part are addressed to Hayes or one of the libraries where she worked. They date from 1930 to 1970 and have a variety of messages mostly with a library connection. I particularly prize these kinds of postcards. I was able to cross check Hayes' entry in the 1970 edition of A Biographical Directory of Librarians in the United States and Canada published by ALA with the postcard addresses. Her education and library work included the Univ. of Wisconsin, the University of Chicago, the Univ. of Denver, the Joint Reference Library in Chicago, and the Library of the Bureau of the Budget in DC in addition to the BCR in Denver. It is apparent that her colleagues knew of her interest in library postcards and shared postcards with her that they found or received. 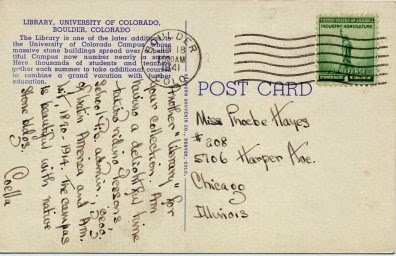 The postcard above was sent to Hayes in Chicago (where she was a student) from a friend in Boulder, CO on June 18, 1941. 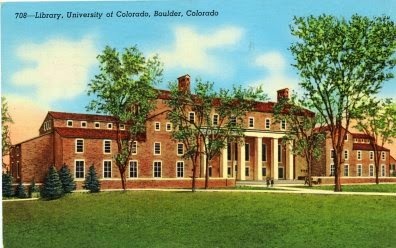 The postcard depicts the Library of the University of Colorado. The message begins with "Another 'library' for your collection." I'll probably share some other postcards from her collection in the future. I've compiled lists of current and former library postcard collectors that I know about. Join Asian Pacific American Studies and the Gleeson Library/Geschke Center for a reading by Asian Pacific American Studies faculty. Sponsored by Asian Pacific American Studies and Gleeson Library/Geschke Center. I'm a collector of envelopes (called covers by philatelists) that have been sent to or from libraries. I believe that I have the largest collection of these envelopes in the world. My collection numbers in the thousands. I'm always on the lookout for envelopes that have a special story so I was excited to acquire the envelope shown above. It was mailed to Professor George L. Burr at the President White Library at Cornell University in Ithaca, NY on April 25, 1911. Andrew Dickson White was the co-founder and first president of Cornell University. White, with the assistance of Burr, developed a remarkable personal historical library consisting of more than 30,000 volumes which he donated to the Cornell University Library. Burr served as the librarian/curator of the White collection and Professor of History at Cornell. He was an authority on the witchcraft trials and was editor of Narratives of the Witchcraft Cases, 1648-1706. He was President of the American Historical Association in 1916. 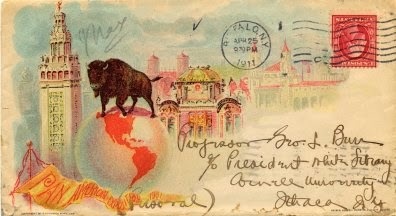 The envelope is interesting in that it was a souvenir for the 1901 Pan American Exposition in Buffalo, NY but was mailed from Buffalo in 1911. It is marked "Personal". I'm putting together a philatelic exhibit titled "Libraries in 20th Century America" and this envelope will make a nice addition to the exhibit. 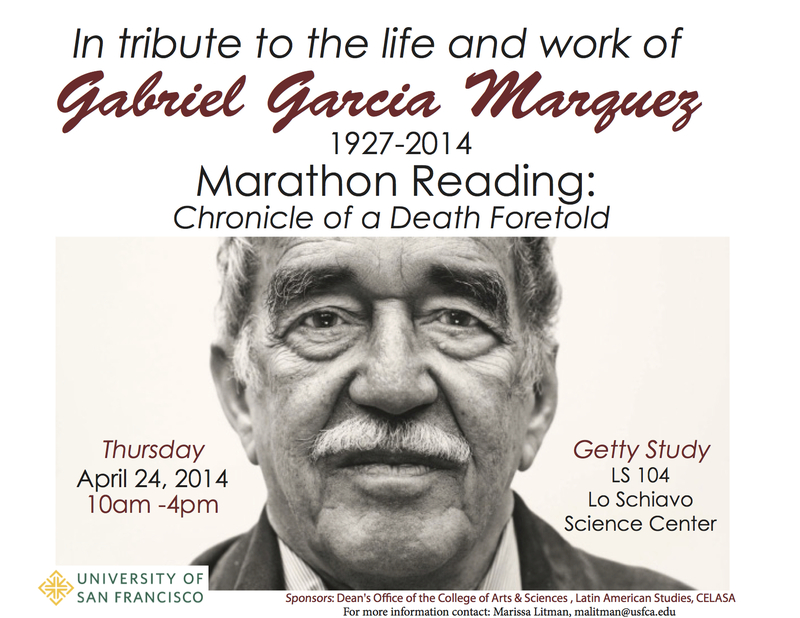 Please join the Dean’s Office of the College of Arts and Sciences, the Latin American Studies Department, and CELASA for a marathon reading in celebration of the life and work of Gabriel García Márquez on Thursday, April 24, 2014. Drop in any time between 10 am and 4 pm to participate in the reading of Chronicle of a Death Foretold in the Getty Room (#104) of the Lo Schiavo Science Center.